Home » Archive by category "Colloquia & Seminars"
Continuing their successful mini-schools from the past two years, the UNC PDE group held their latest mini-school this week. Each two-to-three day school features a series of lectures by a principal invited speaker. This week’s principal speaker was Patrick Gérard, giving a series of three talks on “Long time estimates of solutions to Hamiltonian nonlinear PDEs”. A particular hallmark of the mini-schools is that the principal speakers are asked to make the lectures accessible to graduate students and to provide an indication of some open problems in the research area. This workshop is supported by the National Science Foundation under grant number DMS-1501020 Professors Hans Christianson and Jason Metcalfe. Congratulations to Hans and Jason for continuing these excellent workshops. Prakash Belkale and Justin Sawon are organizing a workshop this weekend at UNC on New Developments in Moduli and Geometric Invariant Theory. The workshop includes 10 speakers from across the country speaking on Bridgeland stability conditions, moduli of stable complexes, and wall-crossing phenomena as tools for studying the birational geometry of moduli spaces of stable sheaves. Support for the workshop is provided by the National Science Foundation under awards DMS-1446356 and DMS-1547117, the latter of which will continue to support workshops on topics in algebraic geometry and representation theory in 2016 and 2017. Congratulations to Prakash and Justin and best wishes for a productive weekend. 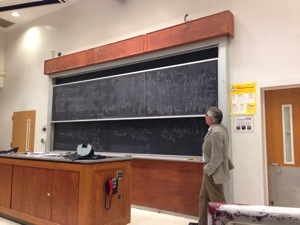 The annual Alfred Brauer Lectures in Mathematics were given earlier this week by Michael Hopkins from Harvard University. 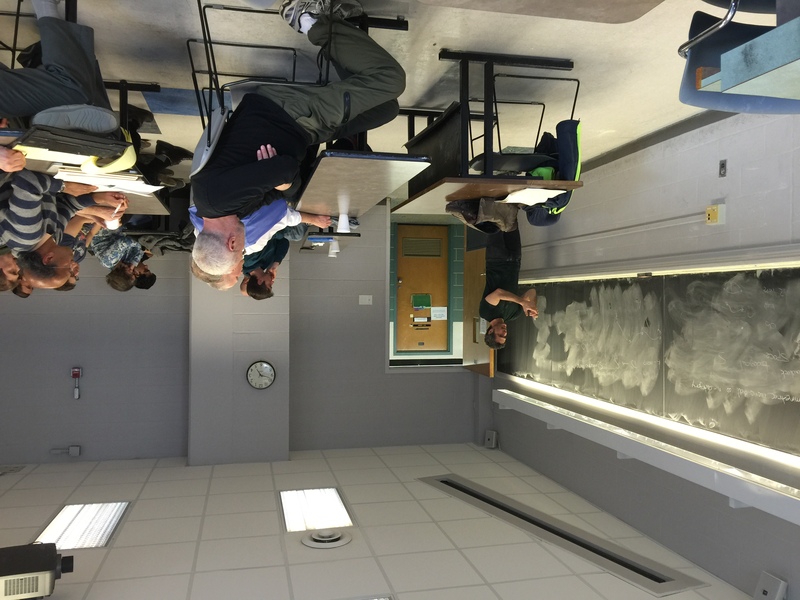 His opening lecture on “Homotopy groups of spheres” was followed by a pair of more specialized lectures on “The Kervaire Invariant” and “The cobordism hypothesis.” Strong interest through the full series of lectures was evidenced by the crowded classroom for his third and final lecture. Thank you to Jon Wahl for once again organizing the Brauer Lectures. 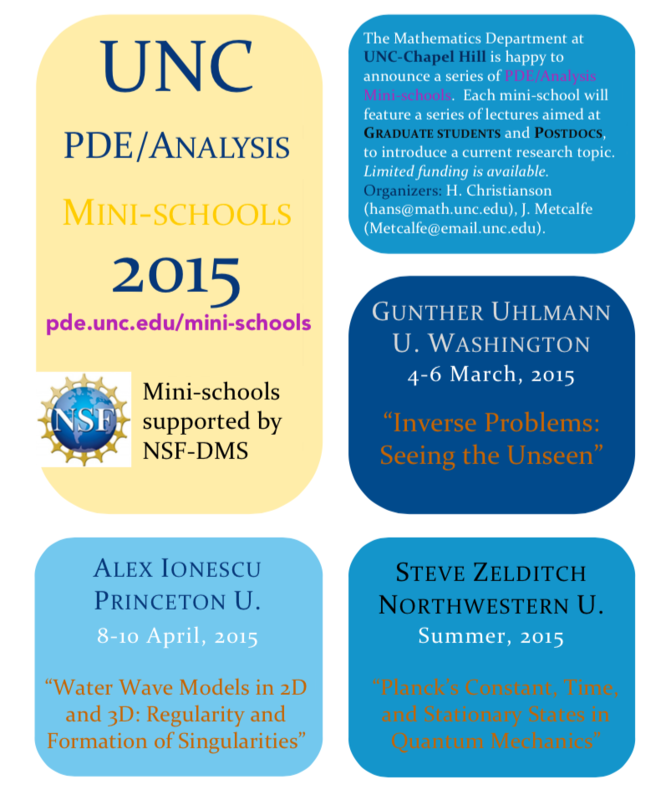 Congratulations to Professors Hans Christianson and Jason Metcalfe for their new grant from the National Science Foundation to support the continuation of the UNC PDE mini-schools into 2017. Continuing from the success of their previous mini-schools, each 2-3 day school will feature a series of 3-5 lectures by a principal speaker. The talks are tailored to an audience of graduate students and are intended to introduce the audience to a modern and important class of research problems. Three to five complementary talks will be given by additional invited participants, often the principal speaker’s graduate students, postdocs, or young collaborators. 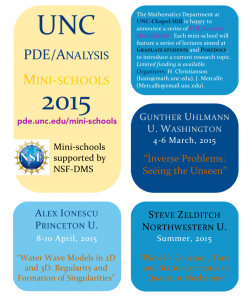 The first UNC PDE/Analysis mini-school of 2015 starts this week with 5 lectures by Gunther Uhlmann (University of Washington), beginning at a graduate student level and introducing a current research topic. The title of this week’s lectures is “Inverse Problems: Seeing the Unseen.” There will be several satellite talks by Uhlmann’s students and postdocs. The full schedule is available online. Congratulations again to Hans and Jason for continuing to bring these great events to Chapel Hill. Congratulations to Carolina Math graduate students Catherine Hsu and Dylan Muckerman, along with their peer at Duke, Humberto Diaz, for submitting a winning project proposal to the Kenan-Biddle Partnership to fund a joint Student Math Colloquium between the two campuses. Talks are scheduled to start this Spring, with information available on their webpage, where one can also subscribe to their listserv. Additional congratulations and thank yous to Prof. Ellen Eischen for serving as the faculty adviser for the Student Math Colloquium. The Group Actions in Riemannian Geometry was held this weekend in Chapel Hill in honor of the career and contributions of Patrick Eberlein, who is retiring at the end of the just-completed academic year, after serving the department, the university, and the profession for many years. Among Pat’s many special contributions, he served as department chair for 10 years, as well as many other department administrative posts, through which he left an important mark on Carolina Mathematics. 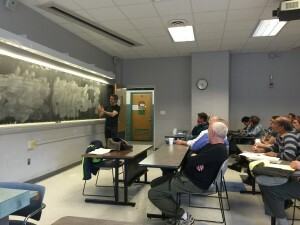 With talks over 4 days, the conference brought together both senior experts in the field as well as young mathematicians to study questions from, and related to, Riemannian geometry in the context of symmetry. 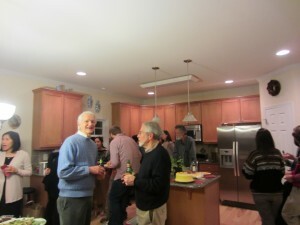 The conference dinner on Saturday was well-attended by conference goers and additional department faculty honoring Pat and his career with a long round of formal toasts. 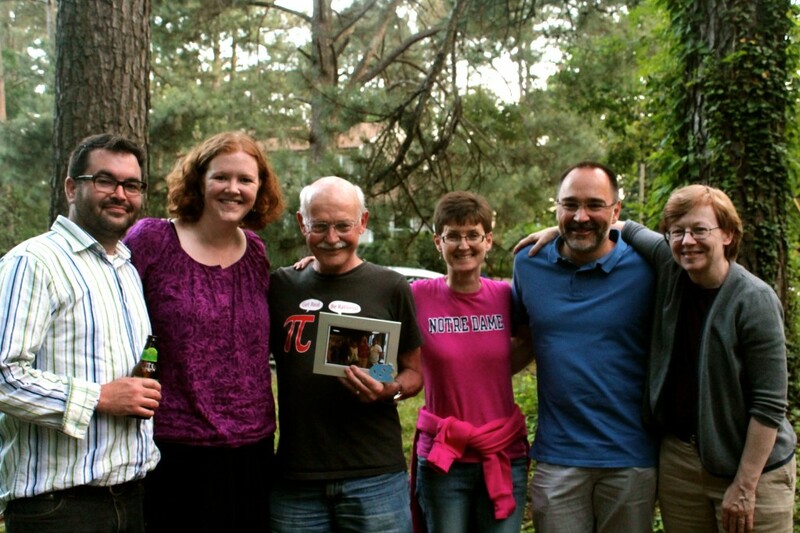 In the picture below, Pat gathers with five of the six Ph.D. students he has supervised during his career. From left to right: Michael Jablonski (University of Oklahoma), Rachelle DeCoste (Wheaton College), Pat Eberlein, Lisa Demeyer (Central Michigan University), Sven Leukert (SAP) and Maura Mast (University of Massachusetts Boston). We are grateful to everyone who put together this wonderful conference, including but not limited to Jason Metcalfe for his local organization. Sir Professor Simon Kirwan Donaldson, who recently became a permanent member of the Simons Center at Stony Brook, gives the Alfred Brauer Lectures in Mathematics this week, titled “Canonical Kähler metric and algebraic geometry.” The first of these three lectures was held yesterday afternoon, followed by a reception, with the remaining lectures today and tomorrow. Professor Donaldson became internationally famous with his 1983 D. Phil. thesis “The Yang-Mills equations over Kähler manifolds,” which proved stunning new results about distinguishing differentiable structures on four-manifolds. This seminal work revolutionized the approach to geometry in dimension four, and led to his receiving the Fields Medal in 1986 (before he reached the age of 30). Through articles, books, and over 40 thesis students, he has influenced complex and symplectic geometry, in particular with recent work on Kähler metrics on manifolds, the topic of his Brauer Lectures. 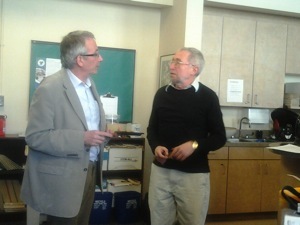 Professor Donaldson (left) speaks with Professor Varchenko (right) at the reception following the first of his three lectures. 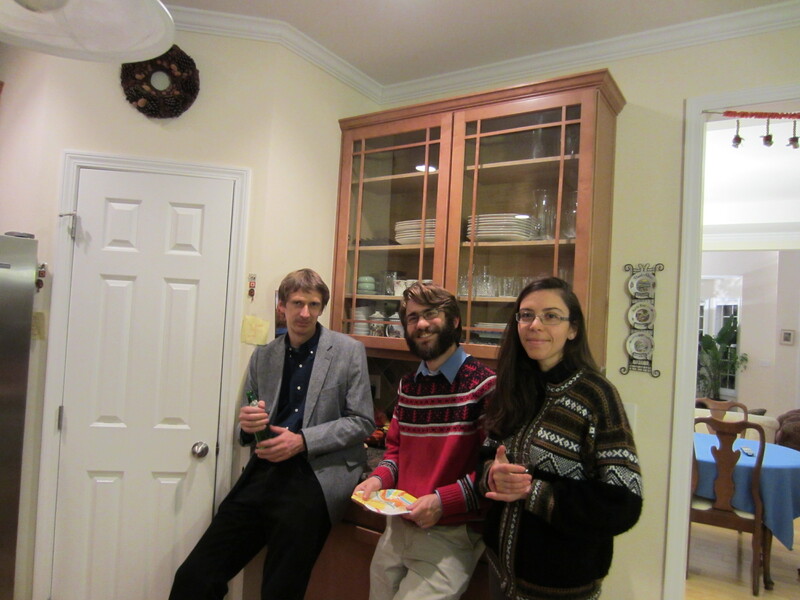 Besides his Fields Medal, Donaldson has among other honors won or shared the Crafoord Prize, Polya Prize, King Faisal Prize, and Shaw Prize. A Fellow of the Royal Society since 1986, he is also a Foreign Associate Member of the US National Academy of Sciences and the French Académie des Sciences. The Alfred Brauer Fund was established by the Department of Mathematics in 1984 on the occasion of Dr. Brauer’s ninetieth birthday , and the Alfred Brauer Lectures began in 1985. The most recent Brauer Lecturers have been Peter Sarnak, János Kollár, Andrew Majda, Jeff Cheeger, Shing-Tung Yau, Percy Deift, Charles Fefferman, Claire Voisin, Alex Eskin, Gérard Laumon, Alexander Lubotzky, and Vaughan Jones. 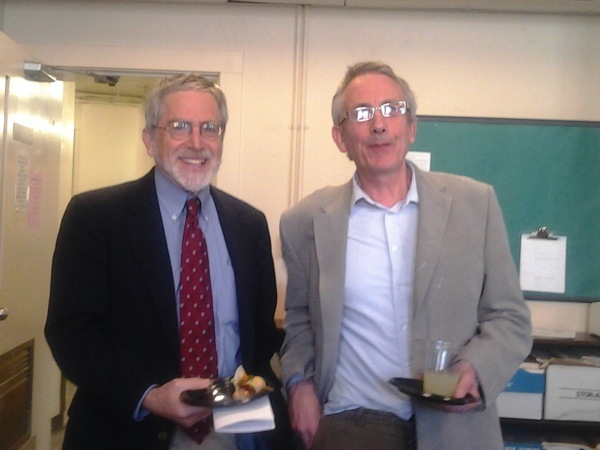 A special thank you to Jon Wahl (pictured left below with Donaldson on right) for once again organizing this year’s Brauer Lectures.